I look forward to Christmas every year just for these these Sticky Buns. They have been a family tradition ever since I can remember. My mother in law introduced me to them and then I instantly was hooked! You really can’t stop eating them! This is a recipe everyone must have! I can’t even describe how good the glaze is over these. An gooey gooey caramel like finger licking good glaze! How is that for a description? The best part about these Sticky Buns is that you can take them out and put them together in about 5 minutes the night before! Then you put them in the oven while opening presents. Then you have warm gooey gooey rolls that fill the house with the most amazing smell. TRUST me on this one! You have got to make them! They will become a family favorite at your house too! 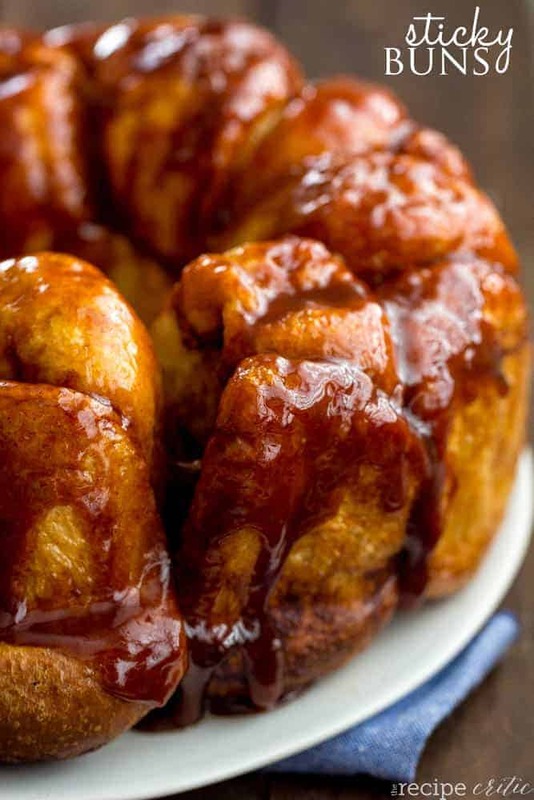 The most amazing gooey gooey sticky buns that you take out the night before and are ready for an amazing breakfast! Grease a bunt pan. Place the 20 rhodes rolls in pan. Sprinkle ½ package Jello Butterscotch cook and serve on top. Sprinkle the cinnamon on top. Melt the butter and mix with the brown sugar. Drizzle over rolls. Cover with a damp cloth and raise overnight. Bake at 350 for 25 minutes. Cook for about 10 minutes and then cover with aluminum foil. The top browns fast! The aluminum foil will help them to cook throughout and not brown the top quite as fast. But cook for the whole time or else the rolls on the bottom will be doughy! Yummy! Be sure come back at link up at Farmers Market Friday. My sister and I used to make a version of these for breakfast on the weekends for the family. 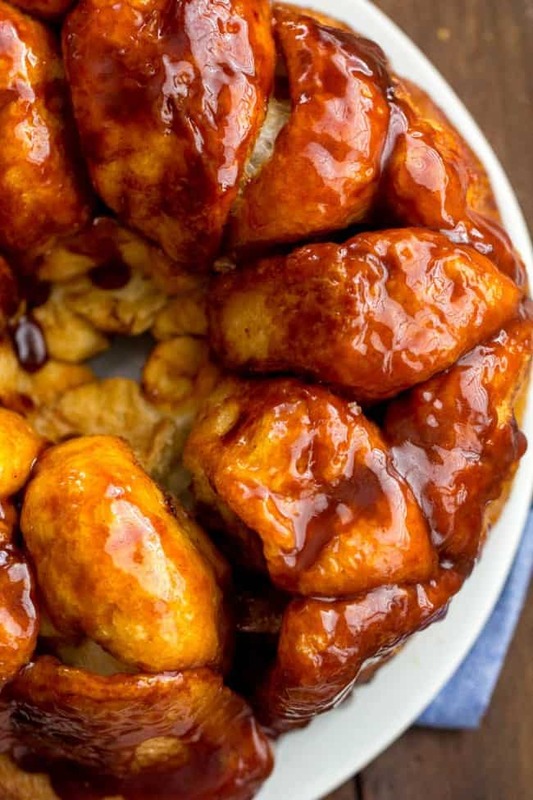 We called it monkey bread. Yours looks perfectly ooey-gooey! Thanks for your great post featuring Rhodes! Feel free to call our customer satisfaction line for a coupon. 1-800-876-7333. Thanks! from the Rhodes Social Media Manager. Would I find Rhodes Rolls in Florida? YEs. Look in the frozen bread section at your grocery store. I made these this weekend and they turned out wonderful!! 1/2 of WHAT of butter? Cup, stick, Tbls? Thanks. 1/2 cup. Sorry I have fixed that! Looks delicious! On step 4, you noted to bake for 25 minutes, then the next sentence you note to cook for an additional 10. Does this mean bake an additional 10 minutes? I think she means to cover with foil after the first 10 min of baking time. Do you use a small or large package of the Butterscotch cook and serve pudding? Did you ever reply to James about the baking/cooking directions and times (25 minutes followed by 10 minutes)? Thanks. Sorry! I should clarify that. The cook time total is 25 minutes. I put them in the oven for 10 minutes and then cover the top with foil for the last 15 minutes so the top doesn’t brown quite as fast and it gets cooked throughout. What type of Rhodes rolls? The cinnamon bun variety? And where do you buy Rhodes rolls in canada? Just checking: we put them in the oven frozen or thawed? Thank you! Do you put in refrigerator overnight or leave on counter to raise? I’ve made this recipe for Christmas for a decade now. We love it! I like to slightly defrost the rolls enough to chop them into fourths so they all get super gooey. Mm can’t wait for Christmas! These look awesome and super easy for Christmas morning. Do you only use 1/2 a package of pudding? Thanks and Merry Christmas! Yes only use 1/2 of the package. 🙂 Merry Christmas to you! I sprinkle chopped pecans on these and that makes them extra yummy ! I tried that this year and it was AMAZING!! What do you do with the other half of the pudding pack? It must be a Canadian thing, but we always add raisins to things like this. Cinnamon buns, sticky buns etc. I you like raisin, try adding some. I thing you’ll love it!! I’m excited to try these. What’s the best way to serve them? Right out of the pan or do you flip them onto a serving tray?